Have you heard about the concept of “jobs to be done” (JTBD)? Essentially, from a company’s standpoint, it’s about understanding the job that people are hiring your product or service to do. 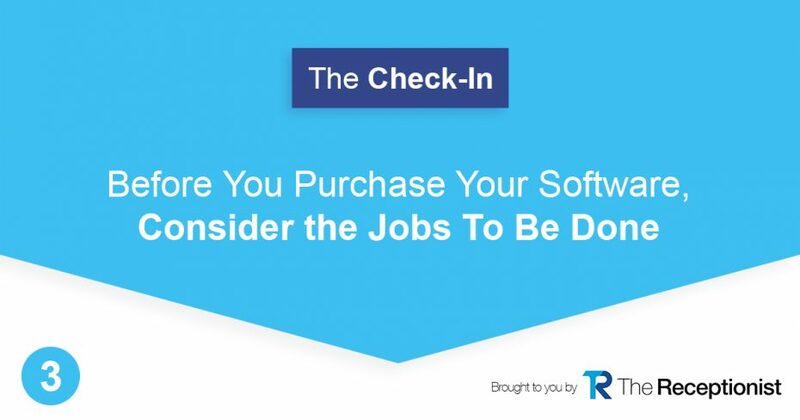 And from a consumer’s perspective, it’s about getting clearer on the job you’re hiring a product or software for so that you’re not haphazardly spending money and then regretting it later because your purchase doesn’t meet your needs. In this episode, Andy Alsop, President, and CEO of The Receptionist shares not only about how JTBD is influencing his company but also shares some backstory on how The Receptionist got to where it is today. First, we chat about Clayton Christensen, Harvard Business School Professor, who has studied jobs to be done (JTBD) extensively and we use his milkshake example to explain more about the concept. He was hired by a fast food company to improve marketing and sales of their milkshake; after spending time in the store, his team realized 50% of milkshakes were purchased before 8am, to a person entering the store alone, and that the milkshakes were taken to go! After discussing the purchases with the customers, they learned the JTBD was to help make the person’s long commute more interesting. Once the company realized this, it made marketing and selling much easier! Another great example of JTBD is highlighted with the Snickers bar. You’ve probably noticed Snickers’ commercials lately, about not getting hangry, and how you’re not yourself when you haven’t eaten; Snickers is now marketing themselves as a meal replacement as opposed to a candy because they realized that’s the JTBD by a Snickers. Genius! Why does JTBD matter for a company? If you’re selling a product, you want to become clearer on the JTBD that your customer is hiring the product for, and it may not always be what you think. Andy shares that by visiting his customers and talking with them, he learns more about how they’re using The Receptionist, which is invaluable information. And, if you’re purchasing a product, software, or service, you want to make sure that you’re clear on what you need it to do, and to remember that not all products will meet your needs. This is part of why we offer you a free trial: so that you can check out The Receptionist and see if you’d like to hire it full-time for your jobs to be done.